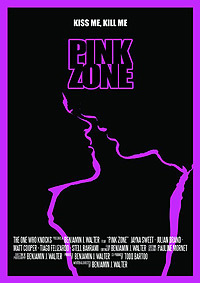 Pink Zone (2014) - Sci-fi-central.com. USA  2014  90m   Directed by: Benjamin J. Walter.  Starring: Jayna Sweet, Matt Cooper, Julian Brand, Stell Bahrami, David Jurbala Jr., Tiago Felizardo, Meaghann Cobb, Violet Paley, Tara Leahy, Courtney Welbon, Cynthia Pinot, Duncan Barrett Brown, Joseph Ahern.  Music by: Bruce Chianese. When a group of young delinquents, carrying a deadly virus for women, attacks a girls high school, the spoiled reckless daughter of a powerful local man has to collaborate with her cruel schoolmates to get out before she gets infected. Some movies are hard to classify when they so brilliantly mashup genres. It's the case for Pink Zone. Yes it was made for no money (just like Nolan's Following or Hooper's Texas Chainsaw Massacre for that matter), but the level of grittiness and its immersive quality makes us forget about it all. It must be the trippiest indie I've seen in a while. It will make you think about it for weeks to come. It's that strong. It has an even bigger meaning in today's state of the country, under President Trump. Review by jackbudapest-25819 from the Internet Movie Database.